The Ritter Hotel , 3-star hotel in Cattolica, has fenced parking for all guests, free WI-FI throughout the entire hotel and services for children. The affiliated bathing establishments has a swimming pool with Jacuzzi. 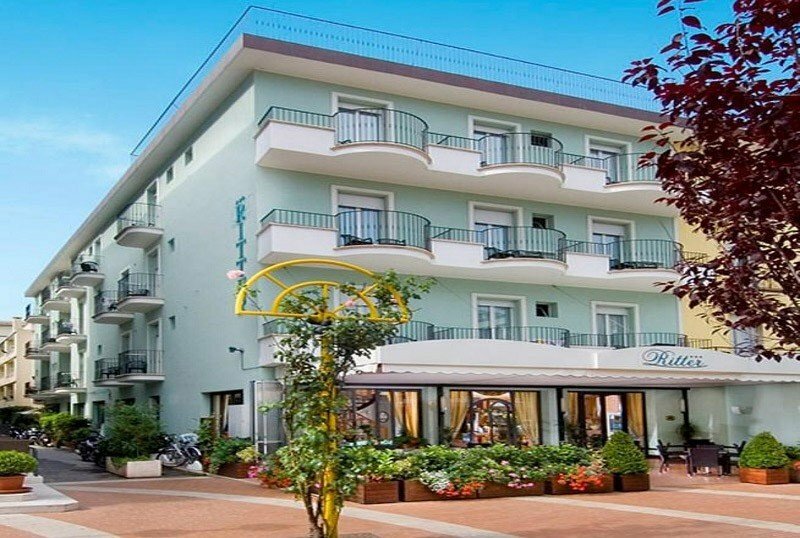 The hotel is located in Cattolica near the sea, directly on the pedestrian promenade of Viale Dante, from which you can walk to Piazza Primo Maggio and its dancing fountains. The Ritter Hotel has 35 bright and welcoming rooms. All are equipped with air conditioning, renovated bathroom with shower and hairdryer, TV, telephone, safe and WI-FI connection. The balcony is present in almost all the rooms. On request: fridge, breakfast in the room. FAMILIES: communicating and family solutions are available. Open-air porch, free bicycles, lift, welcome drink, newspapers in consultation, theme nights. Guests can enjoy the private swimming pool with children's games located 110 meters from the hotel for the exclusive use of hotel guests and the swimming pool on the affiliated bathing establishments. AIR CONDITIONING: available both in the common areas and in the rooms. AGREEMENTS: beach, amusement parks, discos, gym, shuttle service. Excursions organized on request. SERVICES FOR DISABLED PEOPLE: entrance on the ground floor, lift according to law. PETS: small and medium size admitted. BREAKFAST: buffet with homemade cakes, biscuits, hot drinks, fruit juices, chocolate, jams, yogurt, muesli, cereals, cold cuts and cheeses. LUNCH AND DINNER: buffet with homemade pasta, meat, fish and vegetarian dishes. Natural and sparkling water available 24 hours a day. VARIATIONS: vegan dishes on request. In the hotel: children's pool, strollers, possibility of pediatrician and baby sitter on request and for a fee. In the room: cradle, safety rails and baby bath tub. At the restaurant: baby menu, baby food, high chairs, bottle warmer. On the beach: playground area, baby club, entertainment. Guests have access to the swimming pool located at the private garden 110 m from the hotel. The pool is 150 square meters wide with a depth from 120 to 225 cm and is surrounded by a solarium area. Next to it, there is also a children's pool with 100 cm deep water. The hotel has an agreement with the beach club La Playa n. 72, well equipped and equipped with swimming pool with Jacuzzi, fitness area, fields for bowls tournaments, beach volleyball, basketball, table tennis, beach soccer. Finally, there are many services reserved for children including entertainment, games, baby club and junior club. Your holidays have never been so convenient! Give yourself a holiday with us children stay free! Take your children to the sea in the most peaceful and beautiful month of summer. Promotional week all children stay free. Block the best offer, request a quote for your beach holidays. Only for a short time the offer will remain valid blocks the best price book your holiday promotion ... all children stay free. What are you doing this summer? Come to Cattolica! Until June 22nd the children stay FREE! Do not wait! Holidays are always cheaper if you book in advance. Request a quote and block the best offer for summer 2019. This year in Cattolica the holidays start earlier ... A nice opportunity to spend your Easter holidays in our company. We offer all-inclusive packages, with delicious Easter lunch with many specialties all buffet ... Request a quote and take advantage now of this promotional rate! The Hotel Ritter anticipates the summer and reopens for your spring break ... Our beach is ready for the summer season there will already be available beds for the first tan, run away from the city and come to rest with us. ..Request now the estimate and block the price in promotion and if you travel with children the rates for them are super discounted! Block the best offer now! Your stay at the beach has never been so convenient. From 25 May to 22 June Week Promo Family Kids stay Free. Block the best offer now! Your stay at the beach has never been so convenient. From 25 May to 22 June Week Promo Family Kids stay Free. From 23 to 30 June the beach service is a gift. Do not wait for prices to rise ... Request a quote and block the best rate. Do you want to spend a week in Cattolica right in the center and very close to the sea? Treat yourself to a holiday at the Hotel Ritter! Request a quote and block the best rate now, which will never come back! Are you looking for the right offer for you? ask for a quote for your stay in July ... and if you book by March 1 you will have a stay in All Inclusive but at the price of full board. discover all the advantages of an all-inclusive holiday at the Hotel Riiter, block the offer request a free quote with no obligation.